Describe how motors and meters work in terms of torque on a current loop. Calculate the torque on a current-carrying loop in a magnetic field. Figure 1. Torque on a current loop. A current-carrying loop of wire attached to a vertically rotating shaft feels magnetic forces that produce a clockwise torque as viewed from above. Let us examine the force on each segment of the loop in Figure 1 to find the torques produced about the axis of the vertical shaft. (This will lead to a useful equation for the torque on the loop.) 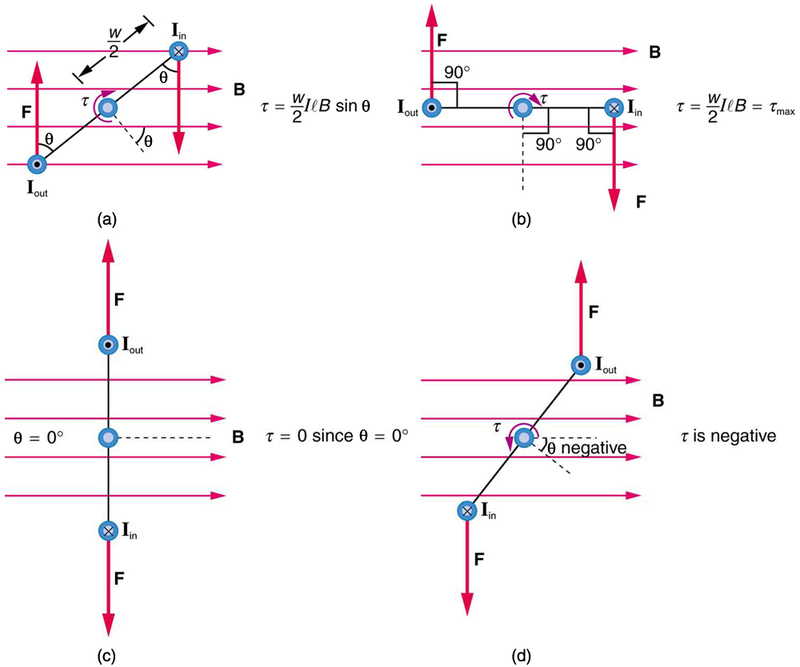 We take the magnetic field to be uniform over the rectangular loop, which has width ww and height ll. First, we note that the forces on the top and bottom segments are vertical and, therefore, parallel to the shaft, producing no torque. Those vertical forces are equal in magnitude and opposite in direction, so that they also produce no net force on the loop. Figure 2 shows views of the loop from above. Torque is defined as , where is the force, is the distance from the pivot that the force is applied, and is the angle between and . As seen in Figure 2(a), right hand rule 1 gives the forces on the sides to be equal in magnitude and opposite in direction, so that the net force is again zero. However, each force produces a clockwise torque. Since , the torque on each vertical segment is , and the two add to give a total torque. Figure 2. Top views of a current-carrying loop in a magnetic field. (a) The equation for torque is derived using this view. Note that the perpendicular to the loop makes an angle θ with the field that is the same as the angle between w/2 and F. (b) The maximum torque occurs when θ is a right angle and sin θ = 1. (c) Zero (minimum) torque occurs when θ is zero and sinθ=0sinθ=0. (d) The torque reverses once the loop rotates past θ = 0. This is the torque on a current-carrying loop in a uniform magnetic field. This equation can be shown to be valid for a loop of any shape. The loop carries a current , has turns, each of area , and the perpendicular to the loop makes an angle with the field . The net force on the loop is zero. Find the maximum torque on a 100-turn square loop of a wire of 10.0 cm on a side that carries 15.0 A of current in a 2.00-T field. Torque on the loop can be found using . Maximum torque occurs when and . This torque is large enough to be useful in a motor. Figure 3. (a) As the angular momentum of the coil carries it through θ = 0, the brushes reverse the current to keep the torque clockwise. (b) The coil will rotate continuously in the clockwise direction, with the current reversing each half revolution to maintain the clockwise torque. Meters, such as those in analog fuel gauges on a car, are another common application of magnetic torque on a current-carrying loop. Figure 4 shows that a meter is very similar in construction to a motor. The meter in the figure has its magnets shaped to limit the effect of by making perpendicular to the loop over a large angular range. Thus the torque is proportional to and not . 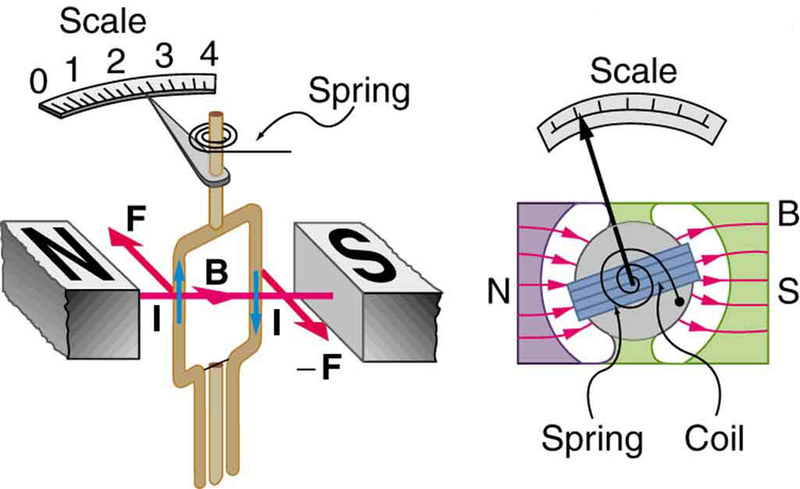 A linear spring exerts a counter-torque that balances the current-produced torque. This makes the needle deflection proportional to . If an exact proportionality cannot be achieved, the gauge reading can be calibrated. 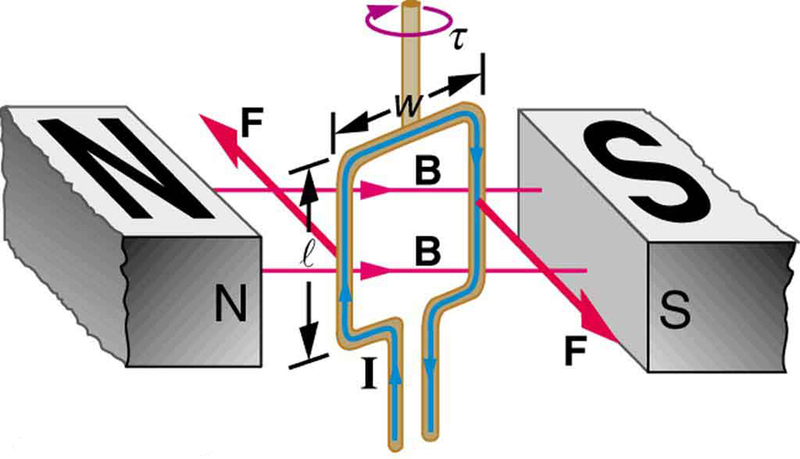 To produce a galvanometer for use in analog voltmeters and ammeters that have a low resistance and respond to small currents, we use a large loop area , high magnetic field , and low-resistance coils. Figure 4. Meters are very similar to motors but only rotate through a part of a revolution. The magnetic poles of this meter are shaped to keep the component of B perpendicular to the loop constant, so that the torque does not depend on θ and the deflection against the return spring is proportional only to the current I.
where is the number of turns, is the current, is the area of the loop, is the magnetic field strength, and is the angle between the perpendicular to the loop and the magnetic field. 1: Draw a diagram and use RHR-1 to show that the forces on the top and bottom segments of the motor’s current loop in Figure 1 are vertical and produce no torque about the axis of rotation. 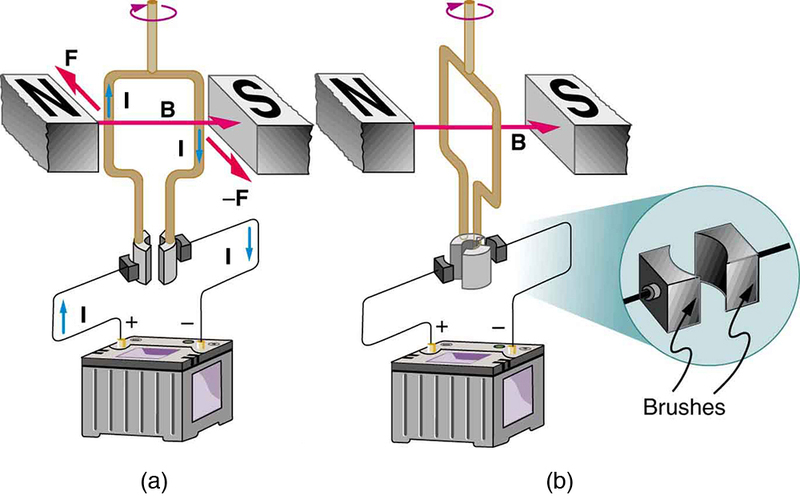 1: (a) By how many percent is the torque of a motor decreased if its permanent magnets lose 5.0% of their strength? (b) How many percent would the current need to be increased to return the torque to original values? 2: (a) What is the maximum torque on a 150-turn square loop of wire 18.0 cm on a side that carries a 50.0-A current in a 1.60-T field? (b) What is the torque when is ? 3: Find the current through a loop needed to create a maximum torque of . The loop has 50 square turns that are 15.0 cm on a side and is in a uniform 0.800-T magnetic field. 4: Calculate the magnetic field strength needed on a 200-turn square loop 20.0 cm on a side to create a maximum torque of if the loop is carrying 25.0 A. 5: Since the equation for torque on a current-carrying loop is , the units of must equal units of . Verify this. 6: (a) At what angle is the torque on a current loop 90.0% of maximum? (b) 50.0% of maximum? (c) 10.0% of maximum? 8: (a) A 200-turn circular loop of radius 50.0 cm is vertical, with its axis on an east-west line. A current of 100 A circulates clockwise in the loop when viewed from the east. The Earth’s field here is due north, parallel to the ground, with a strength of . What are the direction and magnitude of the torque on the loop? (b) Does this device have any practical applications as a motor? 9: Repeat Chapter 22.8 Exercises 1, but with the loop lying flat on the ground with its current circulating counterclockwise (when viewed from above) in a location where the Earth’s field is north, but at an angle below the horizontal and with a strength of . (b) This is not a very significant torque, so practical use would be limited. Also, the current would need to be alternated to make the loop rotate (otherwise it would oscillate). 22.8 Torque on a Current Loop: Motors and Meters by OpenStax is licensed under a Creative Commons Attribution 4.0 International License, except where otherwise noted.